To celebrate National Nurses Week, we did some digging and made a list of jokes that nurses will get, relate to and appreciate. Check out our list and be sure to share one or two jokes with colleagues or a nurse you know. Also, be sure to thank a nurse this week for all that they do. Without them, we would all think simple cold symptoms are the first stages of a deadly flesh eating disease and the end of the human race as we know it. Any kid that has a problem these day gets pills shoved in their mouth. Like, every kid 17-years-old, ‘Oh, we got him on Prozac.’ What does a 17-year-old need Prozac for to get through life? When I was 17, my dad’s version of anti-depressants would be to, like, hold my head underwater ’til I got a little more excited about living. A woman told her doctor that she was really worried because every part of her body hurt. 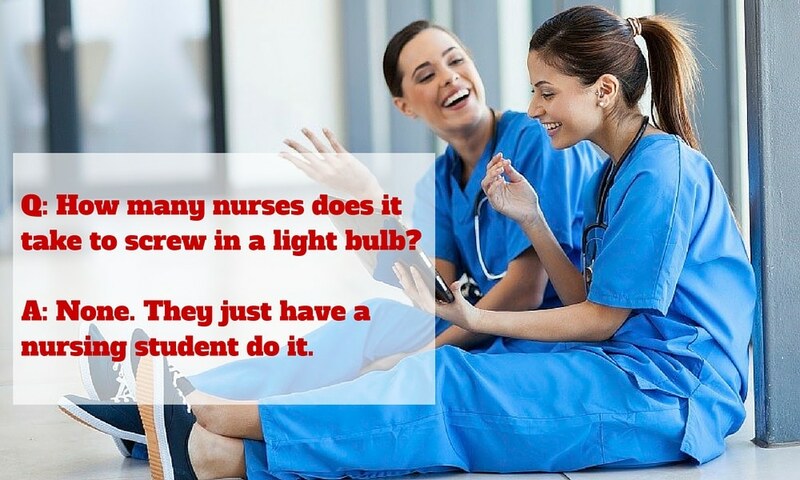 Q: How many nurses does it take to screw in a light bulb? A: None. They just have a nursing student do it. A novice nurse wears so many pins on their name badge. An experienced nurse does not wear a name badge for liability reasons. A novice nurse wants everyone in the work setting to know they are a nurse. An experienced nurse does not want anyone to know they are a nurse. A novice nurse does their head to toe assessments starting at the actual head or toes. An experienced nurse knows that all assessment criteria will be answered during a transfer to the commode! A novice nurse spends hours giving a bed bath. An experienced nurse lets the nursing assistant or student nurse do a bed bath. A novice nurse will spend time bladder training an incontinent patient. An experienced nurse will refer the patient to the physician for insertion of a Foley catheter. A novice nurse looks for blood on a bandage hoping they can change it. An experienced nurse knows a little blood never hurt anyone, so they let it. A novice nurse always answers the phone. An experienced nurse checks the caller ID before answering the phone. A novice nurse tries to make friends with everyone. An experienced nurse knows to use that energy only to befriend the cafeteria cooks, pharmacists, and discharge planner! A novice nurse loves to run to codes. A novice nurse has limited knowledge about these jokes. An experienced nurse is guilty of these jokes.